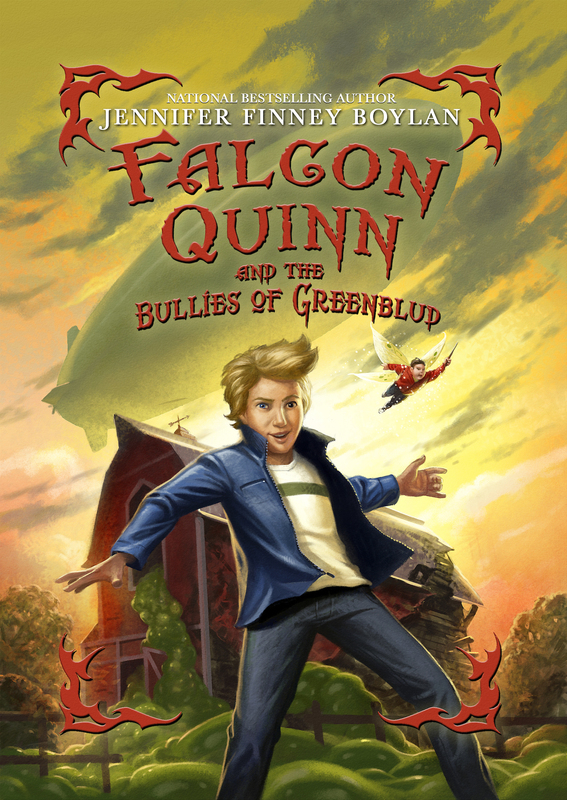 Falcon Quinn and the Bullies of Greenblud is now available! Falcon Quinn and his friends are monsters–a Sasquatch, a Chupakabra, a wind elemental, a Frankenstein–but now they confront the scariest challenge of all: 9th grade. Disguised as humans, Falcon and friends are in a race against time to find five monsters hidden in a New Hampshire high school. An exciting adventure as well as a serious look at what it means to be “different”– FALCON QUINN AND THE BULLIES OF GREENBLUD is a hilarious, moving look at bullies and the bullied, at monsters and humans, at boys and girls–and parents– of all kinds. You can order the book here in paperback, or order it here as a Kindle book. Click here to read a little of chapter 1! Monster up!! School bus 13 screeches to a halt, and you and your friends step out and onto the grounds of the Academy for Monsters. Mrs. Redflint–the dragon lady (and Dean of Students)–tells you you’re turning into a monster, hands you the key to your dorm room, and encourages you to stop by the Wellness Center, where your exact form of monstrosity will be “diagnosed.” If your name is Falcon Quinn, you watch as your friend Max–a huge, hairy dude who plays the triangle in middle school band–becomes a Sasquatch. And your friend Megan Crofton–a quiet, melancholy girl still trying to get over the loss of her sisters–slowly transforms into a wind elemental. All around you are other kids– ghouls, Frankensteins, leprachauns, were-things. But what are you? Are you a monster at all? Well, until we figure out the answer to that question, let’s get you unpacked. Your roommates– a were-bear named Lincoln Pugh, and another guy named Jonny Frankenstein–won’t be arriving until later. In the meantime, there’s a lot to do– ask questions of Quimby, the fortune-telling head-in-a-jar; read The Gullet, the literary magazine of the Academy for Monsters, full of stories and poems written by monsters, (including ROAD NOT TAKEN DESTROY! by young Frankenstein Timothy Sparkbolt); investigate a list of the characters you’re likely to encounter as you stroll around the grounds. 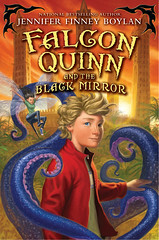 But perhaps the best thing to do first might be to read the first chapter of Falcon Quinn and the Black Mirror by clicking right here. You can also browse the book by clicking on the Browse Inside icon in the column to the right, or right here.. Above all, you must resist your monster nature! You don’t want to be a monster. Do you?